Wizards of the Coast announced this week that Fifth Edition Dungeons and Dragons is in development. This is somewhat surprising, since Fourth Edition landed in 2008, making this by far the shortest gap between editions. I actually only started playing D&D regularly in 2008. Some friends invited me in on the new 4e game that was being launched, and we're just on the cusp of epic tier for this campaign. While I always had the desire to play, I never really had the opportunity to join in until well into my adult years, so I don't have a lot of the same memories - good, bad, or indifferent - about the older editions. Squares have always been 5x5, magic missile has always hit, and it's unlikely a housecat will kill me because I rolled up a character poorly. While I've enjoyed my time with 4e up to this point, I do have my own inexperienced opinions as to what could be done to improve the game moving forward. Refocus on story elements: I love a huge battle as much as the next guy. Few things are more fun in a gaming session than a protracted battle where a couple people come close to death and the heroes end up vanquishing the big bad. The chief issue with 4e, from the three different campaigns I've played in, is that the roleplaying aspect is almost forced to take a back seat due to the battle-first rules, the skill challenge mechanics, and the way that skill training has more or less been delegated to the background. I know it's not the games I've been in - the DMs that have run my games have been, from everything I've heard from bad games, absolutely wonderful. But when such immersive worlds and interesting characters are secondary to getting to the next battle by design, there's a problem. 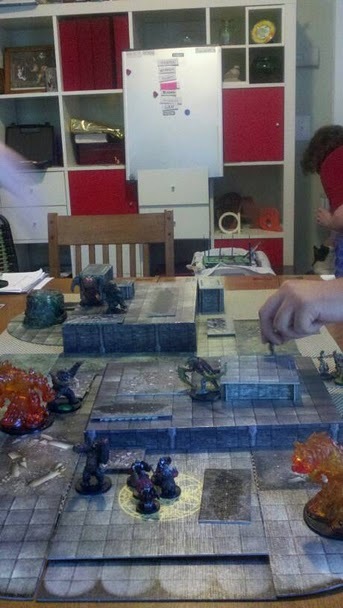 While I'm a big fan of rigidity and clarity in rules, the deference toward battle is not always why I want to play D&D. I've heard this described as the WoW-ification of D&D, how the power cards are very Magic: The Gathering-esque. I think the problem is just simpler than that. If 5e puts the fireballs in the background and brings back the need to focus your skills to the tasks at hand, I could be very pleased. It's easy to set up a game where you just kill things over and over, and many gamers are certainly like that. But when the system is slanted toward battle to the point that it is, it's difficult to escape. Enough with the character builder already: I've come around to using iPlay4e on my computer/tablet when I play D&D now. The character sheet, as it stands, is simply filled with too much stuff and doesn't organize it in a clean-enough way - form over function. It's nearly impossible to get a correct character sheet these days without using the builder, which is a little ridiculous. I understand that young D&D whelps like myself have it easy compared to my forebearers who had to calculate trajectories or whatever, but there has to be a middle ground that exists somewhere, no? Don't worry so much about balance: When I think balance, I think games where you compete against each other, where balance is somewhat necessary, like a Team Fortress 2 or an MMO. The reality is that even an overpowered wizard or barbarian is not going to destroy play the same way - the beauty of why D&D works is because people will gravitate toward their favored archetypes. Myself? I like playing wizards, warlocks - magic users. I didn't enjoy playing a cleric much, and I found the assassin class in 4e to be enjoyable only because it's more of a magical stealth class. My wife plays with us, and she plays a fighter. Why? She just wants to kick some rear end and deliver massive damage. There's no reason to, say, make sure a fireball clears a room no matter what. But if something is overpowered but not game-breaking, where's the harm? The constant errata fixes became unweildly in a short time (and were snuck in on the builder if you weren't paying attention to releases, unfortunately). Save those for truly game-breaking problems or typos in the standard text, or let the DM, who is already using his or her discretion to make encounters challenging, adjust battles accordingly. Find a happy medium between the old ways of battle and the grid: I really liked the quick math that grid-based play offered as a player. Knowing "I need to move within 5 squares" or "hey, this zone is a 3 square cube" makes things very easy. It's also unfortunately jarring for me, especially when you want to use powers during skill challenges or basic role playing. I'm not saying that we need to start calculating feet for distance, but there must be some sort of way to handle this issue that preserves the fun while making tactical maneuvers more available. The grid is both liberating and limiting, and it's a dichotomy that Wizards has the resources and ability to address. Figure out a way to do team ups: In the game I'm in right now, one of the powers that shows up once a session allows our warlord and someone else, typically the fighter, work together on pounding on an opponent. It's a special power with unique circumstances attached to them, but one thing that I would love to see more of is the ability to see two PCs team up and work together as a regular action. Yes, you can "break" things sometimes by throwing people or using existing powers or what have you, but with the amount of time spent on so many powers that few would ever use, emphasizing teamwork to its logical conclusion makes a lot of sense. That it could be supported in the rules with bonuses, as well as for monsters? That could be a true game-changer. The reality is that I'm looking forward to what 5e will bring along. I'm afraid that the "improvements" will be like what us internet denizens are used to - "improvements" to Google Reader, or to GMail, or to Facebook. I'm hoping that the improvements we'll see for 5e really make the game what I think many of us believe it to already be in our minds.